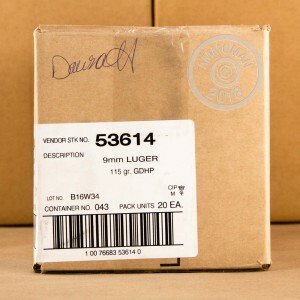 This 9mm Luger version of Speer's highly popular Gold Dot ammunition uses a light, flat-shooting 115 grain bullet. 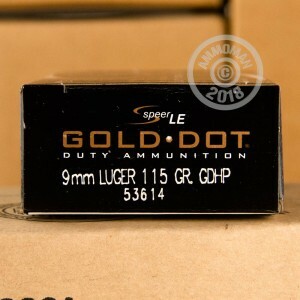 The Gold Dot bullet is a bonded-core hollow point that virtually eliminates the possibility of core-jacket separation, a severe problem that dogged many early JHP designs. Used by CCW holders and police officers across the country, it has a proven track record of producing good expansion and penetration in self-defense situations. As a standard pressure load, it will work great in subcompact handguns like the Glock 26, Sig P938, or S&W M&P Shield. These rounds come packaged in a 1,000 round case (with 20 boxes of 50 rounds each) at a great volume price so you can stock up with ease. 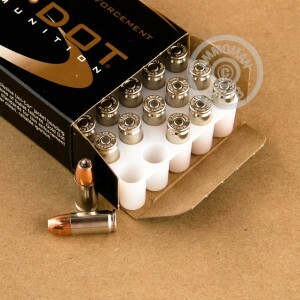 All Gold Dot ammo uses non-corrosive CCI Boxer primers and reloadable nickel-plated cases. Buy more than $99 worth of products from AmmoMan.com to qualify for free shipping!